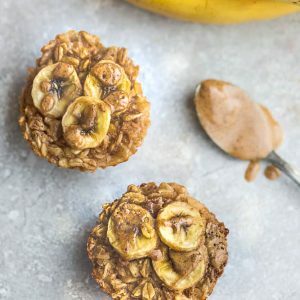 Banana Baked Oatmeal Cups are an easy make ahead breakfast for busy mornings. They have all the flavors of a delicious banana bread but are made with wholesome oats, banana, almond butter and chopped walnuts. In a large bowl, mix the flax seeds and water to make the flax egg. Set aside until thickened (about 2 minutes) (Skip if using regular egg). After 2 minutes, whisk in milk, maple syrup, coconut oil, mashed banana, almond butter, vanilla, baking powder, cinnamon and salt. Fold in the oats. Divide batter evenly into prepared muffin tin or silicone muffin liners. Top each serving with sliced bananas and chopped walnuts, if desired. Bake in preheated oven for 18-25 minutes, or until set.